A game of mystery, exploration, and horror. The original Mansions of Madness was great fun, but it had a few issues: excessive fiddliness, long preparation, setup and pack up times, and most egregious of all, a few gaping errors in its scenarios. But for older gamers like me, it harkened back to the old days when you had to put a bit more effort into a game to see it shine. Mansions of Madness Second Edition is a completely different beast, because all the fiddliness and effort has been swept away by tying the game to an app. And despite my initial misgivings, the game really is more fun for it. Sure, I still have a nostalgic twinge of sadness for the complexity of the original, and I’m still not a big fun of introducing apps to my wonderful tech-free hobby, but the plots are more cohesive and the whole experience smoother. Sadly, the crappy miniature design from first edition remains. Understandably I suppose, so first edition users can still use their old figures and map tiles, but a shame as they really are sub-par. My only other misgiving is the excessive amount of text that players have to read out, but that’s par for the course for this kind of game. But when it comes down to it, most of the first edition scenarios will sit on my shelves unplayed, as this new edition is the one that will hit the table when I’m feeling like a wander through an old dark house at imminent risk of my sanity and health. Horrific monsters and spectral presences lurk in manors, crypts, schools, monasteries, and derelict buildings near Arkham, Massachusetts. If you love creating a story as you play a boardgame, if you enjoy the Arkham Horror boardgame, if you’re a fan of the stories of H. P. Lovecraft—Mansions of Madness is right up your alley. It would seem Fantasy Flight Games created it with the express purpose of making a game as closely based on the unique atmosphere on Lovecraft’s Cthulhu mythos as possible. Arkham Horror is a great favourite of gamers worldwide, but it’s generally accepted that it doesn’t quite capture the feel of Lovecraft’s work—there’s a big emphasis on combat, for example, and not as much on stories of investigation and creeping horror. So exceptional FFG game designer Corey Konieczka, creator of such modern boardgame classics as Battlestar Galactica, Runewars, Starcraft and Tide of Iron, created a game that is unabashedly all about an immersive story and atmosphere. One of the players is the Keeper, a sort of roleplaying Gamemaster who controls the story; the other players are investigators (you’ll recognise some of the characters from Arkham Horror) trying to solve the scenario. Different Objective cards, different scenarios, and unique board tile setups, mean there is a huge amount of replayability. Players choose from eight investigators in their attempt to oppose the Keeper player and stop him from completing his story objective. The gameplay is modified depending on the number of investigators, so the game scales well from 2-5 players. Investigators have three stats on their card: Health (how much damage he or she can take before being killed), Sanity (how much horror he or she can witness before going insane), and a starting number of Skill Points. Seven other attributes—Strength, Marksmanship, Dexterity, Intellect, Willpower, Lore and Luck are chosen by choosing from the investigator’s Trait cards, which also detail various special abilities. These attributes will be used during the game when you are asked to perform an attribute test, and you can spend Skill Point tokens to improve your chances of succeeding. During each turn, an investigator may take two Movement steps and one Action step. You may have to unlock doors that the Keeper has placed in your way, and explore room locations in an attempt to discover items, spells, and most importantly, clues. When you explore, all the cards in the room are flipped over and resolved one at a time. Monsters are divided into the Beast, Eldritch and Humanoid categories, each of which has a specific Combat card deck. Clues are placed around the game board by the Keeper at the start of the game, and guide the players towards their ultimate objective; each clue leading them to the next, following the narrative thread and slowly building up to the game’s climax—which may or may not be combat-focused, depending on the scenario. On the Keeper’s turn, the Keeper player stocks up on Threat tokens, which he can later spend to activate Keeper Action cards to play all kinds of nasty tricks on the investigator players. Some cards allow him to draw Mythos and Trauma cards, and some allow him to add Minions and environmental effects to the game. The Keeper receives a set number of scenario-appropriate Action cards, and he can spend Threat to activate them over and over during the game. Similarly, the story dictates the Mythos cards that are available; these are played during the investigator’s turn but must be discarded once played. The Keeper also has an Event deck which acts as a ‘timer’ for the scenario; as cards are flipped from this deck the plot thickens and things may get more and more difficult for the investigators. If an investigator is occupying a space with a monster in it during the Keeper’s turn, it may attack. Combat is dangerous and sometimes unavoidable, but luckily investigators can use the surrounding environment to barricade doors against opponents, or possibly hide and avoid conflict altogether. Of course, monsters can also drain your Sanity, and if you fail a Horror check you lose 1 Sanity and may become a target for the Keeper’s Trauma cards. If you fail to evade a monster, there’s always the deadly option of engaging it in combat. Monsters are divided into the Beast, Eldritch and Humanoid categories, each of which has a specific Combat card deck. Combined with dice rolls, these cards give an exciting narritive feel to combat, describing in detail what happens when a monster is attacking or being attacked. There’s also an ingenious and original system of representing ‘intellectual challenges’, in the form of puzzle tiles. The investigator receives a number of actions equal to his Intellect attribute to swap, rotate or discard pieces in order to solve an actual puzzle—rewiring a circuit, or picking a lock, for example. Of course, this is a Fantasy Flight game, so the components are top-notch: 24 highly detailed monster figures and 8 investigator figures, over 300 cards, over 200 tokens, nearly 70 puzzle tiles, and 15 beautifully illustrated map tiles that make up the playing area. Lots of additional scenarios, some available as ‘print on demand’ supplements, are also available. This rules summary and reference includes the rules from the Forbidden Alchemy and Call of the Wild expansions. 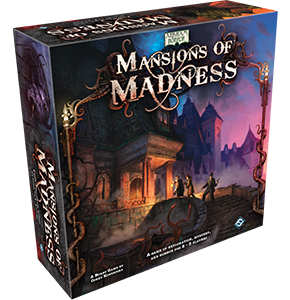 You’ve bought the game and braved the dark corridors of the Mansions of Madness; you’ve solved challenging puzzles and tracked down hidden clues—you’ve even confronted the most horrific eldritch creatures and survived with body and mind intact! But have you faced the ultimate challenge..? I won’t be covering the basics of painting miniatures here; for that information see my article Figure Painting for Beginners, which covers everything about miniature painting you need to get started: preparing your workspace and figures, shading, highlighting and detailing, basing and varnishing, and various painting styles. Here we’ll be looking at my painted set of MoM figures and pointing out some colour choices and techniques. Keep in mind, of course, that these are just my choices and are in no way official—if you want a bright red shoggoth, you go right ahead! This is just the way I painted mine, and there are as many ways to paint miniatures as there are painters. The old Games Workshop paint colours are referred to here, but there are many other excellent brands of paints available, including Vallejo GameColor, Reaper Master Series Paints and Privateer Press Formula P3. Experiment and have fun! Remember, prepare your figures by washing them in detergent and water to get rid of any oily residue from the moulding process; cut or file off any obvious mould lines or bits of extra plastic (watch those fingers! ), and affix the miniatures to some suitable surface for ease of painting. I use long strips of foamcore to which I stick the figures with white glue. Undercoat as you see fit—I use Citadel Skull White spray. I use a white ceramic bath tile as a palette and it’s served me well for years. Completely optional but essential in my case were a couple of rainy days and some excellent BBC History podcasts to occupy the part of the brain you don’t use when you paint! The investigator figures were the most time-consuming step of the project, mainly due to the number of colours involved. 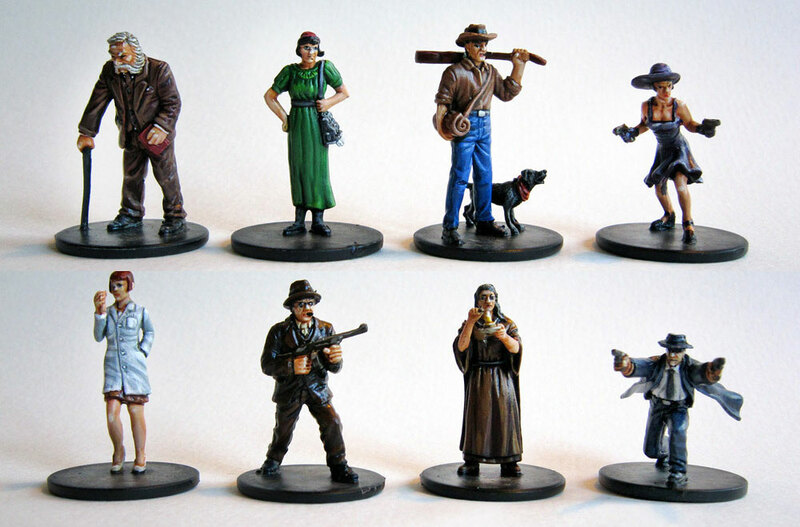 The investigator character cards give you a guide for the basic colours used for each figure. In general, I quickly paint on the base colours, let them dry, wash (quite often Devlan Mud, though Gryphonne Sepia for flesh and the appropriate colour for greens and blues), and then highlight; first with the base colour then in progressively lighter shades—perhaps two, with a final edge highlight. You could use all manner of different shades for the various complexions of these characters, but I tend to stick with a blend of Dwarf Flesh and Elf Flesh for the basic skin tone, washed with Gryphonne Sepia and highlighted with Elf Flesh. The sharpest highlights—the tip of the nose and the knuckles usually—get a tiny spot of white. There are many ways to do eyes, but I don’t worry too much about perfection with such small figures. Two small dabs of black, and then two tiny dots of white on either side of the iris—usually with a tiny bit of black to clean up. The hair on these figures is the only place I’ve used the drybrushing technique; I prefer to highlight manually, but remember to mix water with your colour so it flows nicely from the brush. For the bases, I made them a bit more interesting than basic black by stippling on a few shades of brown, from dark to light; it just adds a bit of visual texture to the base. However I didn’t worry about the monster bases, and in fact only stuck the monsters on their bases with a small dab of white glue, in case for some reason I want to interchange bases later on—for example if I choose to replace some of these figures with sculpts from other companies. Now, on to the bad guys! What would a Lovecraftian game be without some twisted degenerate Old One-worshipping cultists? I kept the basic cultists suitably drab with a dark brown cloak—Graveyard Earth mised with a bit of Chaos Black, basically—with a trim of Dheneb Stone (a steady hand and a small brush are required here, though you can touch up later). A few tiny dabs of Mithril Silver were used for their medallions, and a dab of Warlock Purple for the centre gem on their staff thingies. Not the most threatening bunch of zombie figures I’ve ever seen—they actually looking like they’re rather sheepishly saying “hi there”—but they’re easy to paint. Slap on some Rotting Flesh, wash with Devlan Mud, and highlight with Rotting Flesh and Skull White. In an attempt to make them a bit more scary I added a bit of Red Gore for blood splatters, plus some appropriately-named Graveyard Earth drybrushed over their feet. Dabs of Skull White for the eyes give them that dead-eye look. This shot also illustrates the importance of good figure preparation—there’s a rather obvious mould line on arm of the zombie on the left there which I should have removed before undercoating. Oh well, they’re just gaming pieces after all! These surprisingly modest evil witches were very easy to paint. A mixture of Dwarf Flesh and Elf Flesh for the basic skin tone, washed with Gryphonne Sepia and highlighted, and Dheneb Stone for the robes, washed with Devlan Mud and highlighted with white. A subtle drybrush of blue on the black hair makes the hair colour seem even darker. Viola! Evil 1920s temptresses! These maniacs are in great poses, though I defy you to get that damn she’s a maniac, maniac I know … song from Flashdance out of your head while painting them. Simple white shirts, washed with Devlan Mud (use a brush to soak up any wash that builds up too much on the raised areas or in the crevices—always control your wash! ), contrast nicely with an excessive blotch of Red Gore—and don’t forget the axes! The stain was made by dabbing on the model with the end of a Games Workshop drybrushing brush, which gives a nice stippling effect. Someone always has to lead your cultists and who better than a cultist leader (or two). This colour scheme was nicked from the BoardgameGeek game listing photographs—always a good place to go for inspiration—and contrasts nicely with your cultist rank-and-file. Again, a simple way to get your whites whiter than white is a Skull White basecoat washed with Devlan Mud, then highlighted back up with white. Easy! The red is Blood Red, highlighted by mixing in a bit of Golden Yellow. The skulls on their belts are Bleached Bone, washed with Devlan Mud and highlighted with Bleached Bone and Skull White. The necklace medallion is Shining Gold—they are richer than your average cultist, after all. These weird extra-terrestrial critters are Mi-Go, the ‘fungi from Yuggoth’, one of Lovecraft’s weirder creations (and that’s saying something). They appear to removing brains—charming—an Elf Flesh washed with Baal Red with sharp highlights of white (though perhaps brains should be grey … oh well!) The Mi-Go themselves are mostly the usual flesh mix with highlights; and I did use a bit of drybrushing on the wings, I remember. The strange masks they wear (not the most effective human disguise really) are painted with Bleached Bone. The Hounds of Tindalos are immortal horrors from another angle in space, created by Frank Belknap Long, though Lovecraft mentions them in his story The Whisperer in Darkness. The base colour used is Graveyard Earth, with a wash of Devlan Mud, highlighted up to Bleached Bone. The long tongue and eye are a wonderfully contrasting Enchanted Blue, highlighted with Ice Blue and white. And finally, the big bad shoggoths; shapeless congeries of protoplasmic bubbles, faintly self-luminous, and with myriads of temporary eyes forming and un-forming as pustules of greenish light all over the tunnel-filling front that bore down upon us … Lovecraft would have been horrified to see his shoggoths given legs, and some gamers have chosen to pop them off and use ‘green stuff’ to putty over the gaps, but Lovecraftian accuracy doesn’t bother me so much. I used a mix of various greens and Chaos Black to get a very dark green basecoat, then highlighted up using smooth, thin strokes of various lighter shades of green. Mix in plenty of water with your paint to get a good flow from the brush, and loosen up a little; you can even use progressively smaller brushes. I kept the overall colour quite dark to contrast with the luminous eyes, which are Goblin Green with a highlight of Scorpion Green (I painted both on wet so the colours swirled together a bit) with a final dot or two of white. A generous coat of Gloss Varnish is de rigeur for your Lovecraftian protoplasmic horrors. 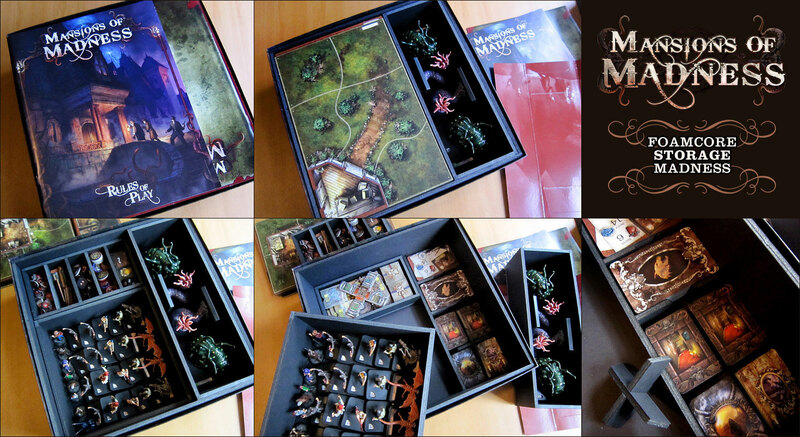 There are a lot of little counters and a lot of relatively fragile miniatures in Mansions of Madness, so it’s a perfect candidate for the custom foamcore insert treatment. The following photograph should get you started on creating your own. Note the two removable counter trays. The card tray on the right doesn’t leave enough space for fingers to get to the smaller cards, so I made a removable ‘X’-shaped piece that keeps them in line. thanks for your great painting guide!!!! But could you please make a guide for your foamcore insert? The Idea with the removable inlays is great and I would appreciate it if youl could show us how to rebuild it. Will you be posting the plans for the foam core insert? Yes I will — keep an eye peeled, it will be the next set of plans to be posted. Sorry it’s taken so long! Hey, no worries. Quality work like what you put out takes time. Thanks for the plans! I use sleeved cards ( FFG sleeves ), so had to modify the plans quite a bit to get them to work with this setup, but used your ideas and just shifted things around in the box to make it work. Hey Steve, I also use sleeved cards and are thinking on building these inserts. Do you have any suggestions on how to modify the plans to fit the cards? Thanks in advance. Sorry it took me so long to approve that comment Sergio, I’ve been ill.
No problem, I hope you feel better. Well done! All my plans are just suggestions, so it’s good that people can play with the design to get exactly what they want. It was my first batch of painted miniature, a lot to improve, but I’m a poor engineer that struggle with art concepts! As you may see, I was inspired by a couple of your miniatures. First batch? Wow, they look fantastic! Well done, and you’ll only get better and better as you paint more. Good one Pedro. Next step is to try my hand at painting! Excellent, nice work! Always good to see the plans in action. Love the designs….one question, however. Do the foam core insert plans allow for the addition of the parts from the expansions, or would I need to tweak the measurements/get a different box? I doubt you’d be able to fit them all in one box. This design is just for the core game and I just managed to fit all that in! Thanks for the foam core guide. Made my very first one last night for my new mansions game. Much better than bagging all the pieces. Going to try your painting guide for the miniatures too. Making this insert this weekend! I was curious though, do you glue your figures to their base? I find it hard to get some of the pieces in their stand and then if they go in thier stand to stay in place, so I was going to glue them all. After looking at your pictures though it seems that the giant worm things are not glued to their base. Just curious before I go gluing everything. Next up paint? (maybe? someday). Yes, I do glue them (except for the worms and – in the expansion – the Dark Young as they wouldn’t fit in the box if glued). 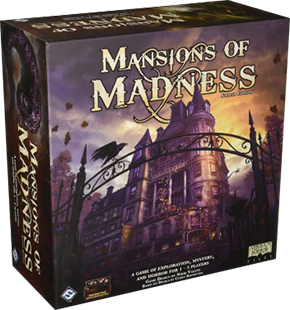 FFG just announced a second edition of Mansions of Madness. APP driven and full co-op, so APP takes keeper role. It comes with an upgrade kit to use first edition components and can be played solo, so I’m very interested in this. So rare I get to play it, but solo interests me. Very glad to hear about the upgrade kit. I love this game but I wouldn’t be keen to buy it all over again. Fantastic that this game is getting some love! I think the wording implied upgrade was included, not a separate item, but if there’s no repetition of tiles, new adventures, new monsters and new Investigators, it’s just a big box expansion with revised rules. I’m willing to buy that and just reject a few kickstarters I was watching to fund it. More details this week. And well done FFG for keeping it a secret… HPL would be proud. Yeah, I’ve read the announcement now. Oh well, as long as I can still use my base set, though it’s a shame all the expansion adventures I bought probably won’t get played now because of the new shiny thing. Surely the adventures in the new set will be different. Descent app allowed Lieutenant pack addons, so I’m assuming the expansion adventures for MoM will be useful too. Maybe found out with other announcements this week. Would love to see insert plans for V2 of the game! (We loved it so much, we rushed out and instantly bought v1 as well!) Any v2 plans in future? Loved your videos also btw – very excited to get painting! I’m sure I’ll get around to it eventually! Is there going to be a guide for Mansions of Madness 2nd Edition? I would definitely appreciate your effort on the 2nd Edition. I’ve played this at least half a dozen times and although a rules reference always helps, the app does most of the work. Oh… I misread that… what I was thinking of, were foamcore plans vor 2nd ed. Finally got around to painting the miniatures from Beyond the Threshold and it was incentive enough to get me re-basing the rest of the miniatures. I had some spare 30mm bases lying around and managed to remove most miniatures (they were glued) without losing the stump to stick them into a new base. Some I had to cut from the base and pin instead. Only done the humanoids so far and may not bother with the bigger creatures. I am considering using the rebased humanoids in Carnevale when that arrives. I’m busy doing this too, and it’s a vast improvement. I’m not basing the large creatures at all. Oh – yeah, basing those. Are you marking the bases with Awareness and Horror? I’ve been looking for some coloured sticker numbers and not found any that are appropriate. Back up plan is either a master list of all monsters to refer to, or just keeping the card tokens handy. I’ll just keep the tokens nearby. Great Job… love your Player aids…..
Maybe some flavor text would be nice also…. I’ll put it on the (very long) list of things to do!